Thank you for taking time to recycle while staying in your Outer Banks vacation rental home! Some Outer Banks towns Recycling at your Outer Banks vacation rental home offer curbside pickup and some offer centrally located drop off centers. If you're staying in an Outer Banks rental with curbside service, please remember to roll your can out the night before pickup. 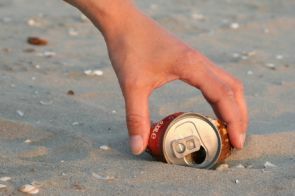 Carova & 4x4 Beaches: Recycling must be dropped off at the Trash Collection Center. Directions: Take the access road at Mile Marker 20 (just north of Wash Woods Lifesaving Station). Turn right on the 4th road. For additional information, call (252) 453-9832. Corolla: Curbside pickup (green containers) from Pine Island to the end of the paved road. Pickup is on Saturdays from May-September and on Wednesdays from April-November. For more information, contact Currituck County at (252) 232-2504. Duck: Curbside pickup (blue container) is available year-round. Pickup is on Mondays from May-October. From November-April, curbside pickup occurs the 1st and 3rd Monday of each month. For additional information, contact the Town of Duck at (252) 255-1234. Southern Shores: Curbside pickup (maroon, red or blue container) is available year-round. Pickup occurs every Monday from June-September. From October-May, pickup occurs on the 1st and 3rd Monday of each month. For additional information, call the Town of Southern Shores at (252) 261-2394 ext. 221. Kitty Hawk: Recycling must be dropped off at the Kitty Hawk/Dare County Recycling Center. It operates from 8:00 a.m. until 3:00 p.m. Monday through Saturday. The center is located on Bob Perry Road next to the Dare County Boat Ramp. Directions: Turn west on West Kitty Hawk Road, across from Kitty Hawk Post office (approx. 4 milepost); Follow West Kitty Hawk Road; turn left on Bob Perry Road (small brown sign with "RECYCLE" and an arrow pointing left on shoulder of roadway); Stay on Bob Perry Road, recycling center on right (along with public boat ramp, picnic area etc.). For additional information, contact the Town of Kitty Hawk at (252) 261-1367. Kill Devil Hills: Recycling must be dropped off at the KDH Recycling Center. The center operates Monday-Friday from 8:00-4:00 and Saturdays from 8:00-2:00. Directions: 701 Bermuda Bay Boulevard - Turn onto Colington Road (across from Dairy Queen) and take a left on Bermuda Bay Boulevard. For additional information, contact the Town of Kill Devil Hills at (252) 480-4080. Nags Head: Some homes offer curbside pickup through Outer Banks Hauling on Tuesdays. Otherwise, drop off your recycling at these convenient locations: Town Hall - 5401 S. Croatan Highway, Public Works - 2200 Lark Avenue, and Huron Street Beach Access - Mile Post 17. For additional information, contact the Town of Nags Head at (252) 441-1122 or 441-1123. Hatteras Island: Some homes offer curbside recycling on Hatteras Island and there are also two drop off locations. One is in Buxton behind the PNC Bank on Buxton Back Road, and the other is at the Chicamacomico Fire Station in Rodanthe. For more information, contact Dare County Public Works at (252) 475-5880.